Packed lunches, that is!! We are in the final stretch of the year – tomorrow + 4 days next week + 1.5 days the following week and it’s SUMMER VACATION!! We had a crazy busy week, again! Last night I had book club here, Mexican theme! And tonight I went to Brady’s soccer game(it went well, they won by a ton) and then helped a neighbor make a diaper cake. People at school often ask me how I have the time to make such healthy lunches and I think it’s pretty easy as long as you have planned ahead. This week’s lunches were leftovers like usual but I thought I would show how easy it is to take healthy leftovers. It’s great if you take the time to make a healthy dinner. We always try to get at least 1 dinner and 2 lunches out of a meal, and sometimes we get more!! Since I eat breakfast around 7:30-8ish and lunch at 11:15, I am STARVING by 2:30 – 3ish. Luckily my kids had special at 2:40 each day this year, so I was able to eat a snack then. Usually I would have a piece of fruit with something else to fill me up but not make me stuffed before dinner. 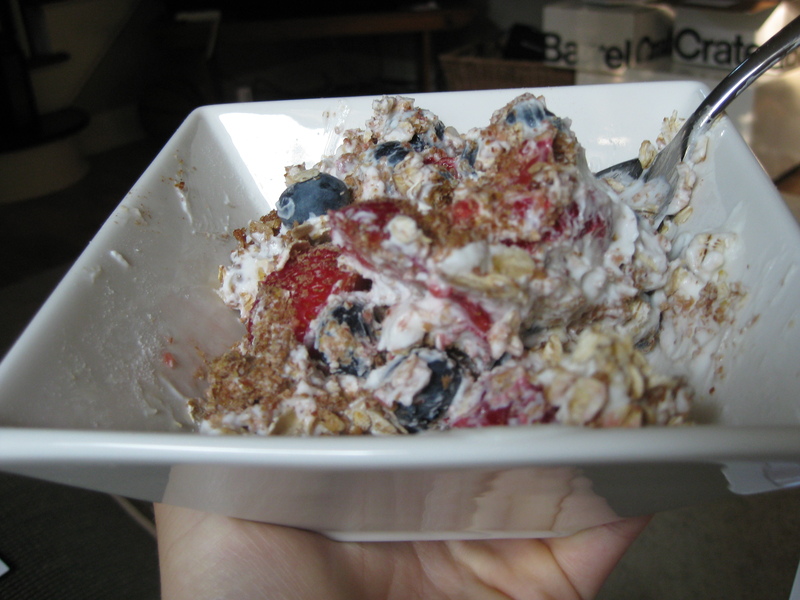 Many times this year I made this “breakfast cookie” dip for my fruit. Mix all together and store in the fridge until ready to eat! Soooo good and just the right amount of full. More packed lunch ideas to come! Today started bright and early when Brady headed to the airport at 4:15am to catch his flight. I debated whether or not to go back to bed but decided going to the gym would be much more productive. Plus, I skipped 3 days last week while I was out of town and I am feeling it. At the gym, I did an hour of run/walk/weight intervals. It was a great sweathy workout and I ended up running over 5 miles and burned over 500 calories. It was much needed. Now I need to stay on track this week so I can feel better than I have been. I can attribute most of my yucky feelings to sadness, but regardless I need to shake them and working out is the best way. So my breakfast consisted of a clean and large container of fruit! Cantelope, banana, and pear with a packet of GoLean oatmeal sprinkled dry on top. I eat this almost everyday for breakfast! It’s so good! Lunch: Leftover whole wheat pasta with veggies. I didn’t eat the chicken. For some reason I am not able to eat chicken that is not cooked right before I eat it anymore. I used to have no problems with it – but not anymore. I took it out and threw it away. My dinner was a black bean burger on a ezekial roll with lettuce, tomato, avacado and relish. I had a side of kale chips. Any my desser! Thanks for the great idea Angela!! This morning I was planning on going to the gym around 8:30 so I made an “egg mcmuffin” around 7:30. I heated some fresh broccoli and mushrooms then added 3 egg whites and a pinch of parm. While that was cooking I toasted a multigrain English muffin. The end product: delicious, filling and fresh! 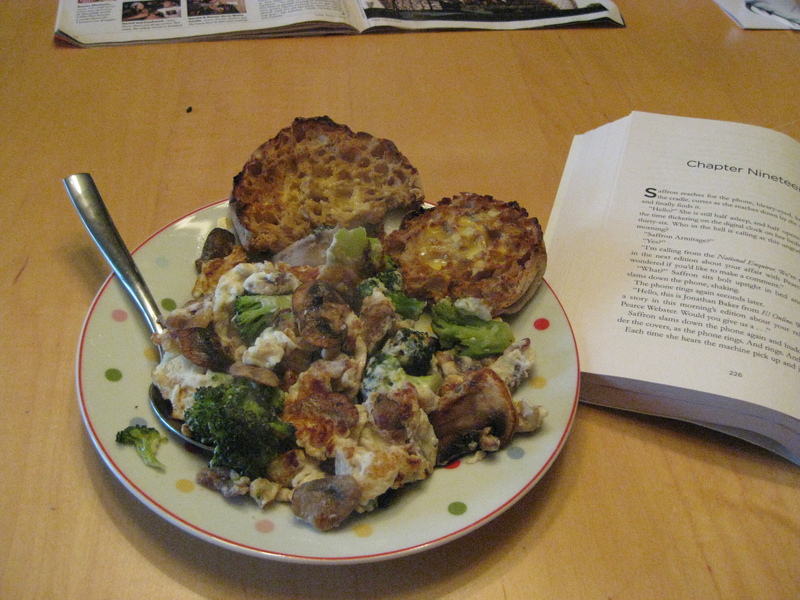 Since Brady had already eaten and headed to work, I shared breakfast with my book, Second Chance by: Jane Green. I warmed up the oats, banana, milk and water. When it was done I added everything else! It was soo good! 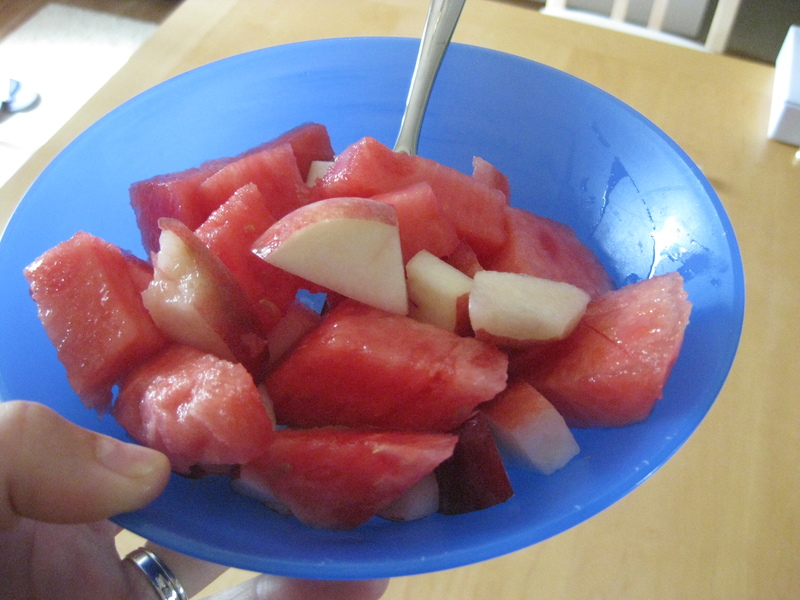 For a snack, around 4:00pm I had a bowl of fruit! It included: watermelon, 1/2 white peach, blueberries and strawberries. I thought to hold me over until dinner, around 7, I needed a little more so I added 1 tbsp. of granola. That worked for a while. Then around 5:30pm, I was either hungry or most likely bored, so I had the rest of my greek bulgar salad. There was like 5 spoonfuls left. Now I am off on a run/walk with a teacher friend! We are having dinner after but I have no idea what that is going to include yet. Brady is golfing tonight so I thought we would just see what we felt like! I had a long list of things to do today and it started off great. I got my new microwave (I mean Advantium Speedcook Oven) installed and headed out for a 4.5 mile run. I was back and feeling great, for a while. I took a shower and felt really nauseous. I thought it might be hunger from the run and the early breakfast so I made a little lunch. 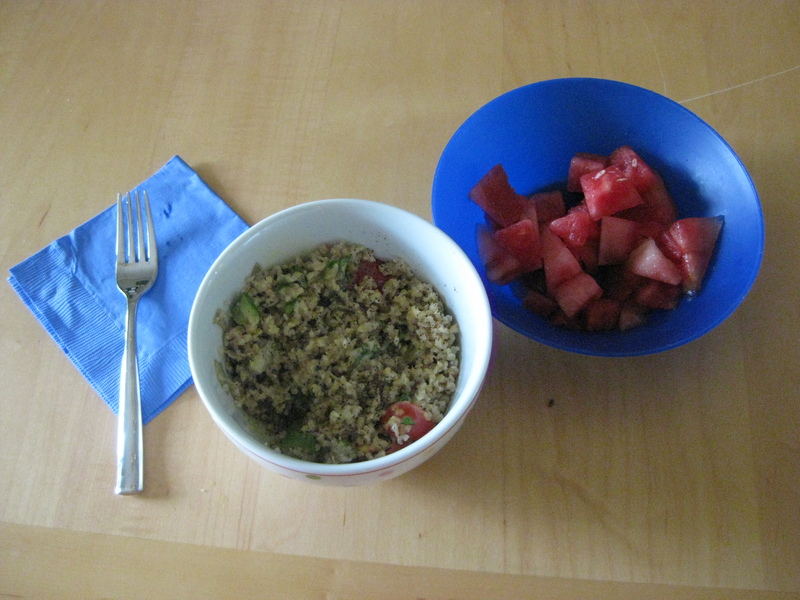 I had left over Greek Bulgar Salad and leftover watermelon. I fell asleep for about an hour and a half. I did some things around the house then. Around 4:30pm I was hungry so I had a little bowl of fruit to tide me over. 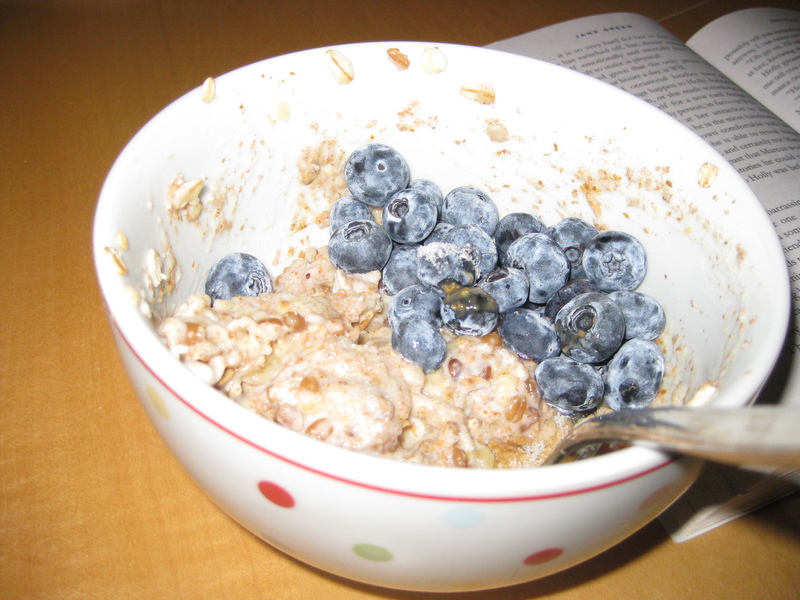 I started the day with a bowl of dry oats, blueberries, strawberries, Fage, ground flax and wheat bran. It was good and filling and held me over through a CRT workout class. CRT is a interval class that uses the Bosu ball and strength training. After class I did 25min. on the elliptical. It felt good and I needed it! After the gym, I ran some errands. I was starving around 1pm while I was at the store so I picked up a box of my favorite popcorn. On the way home I stopped to visit someone and at the bag of 94% fat free kettle corn. It was great and held me over for a while. 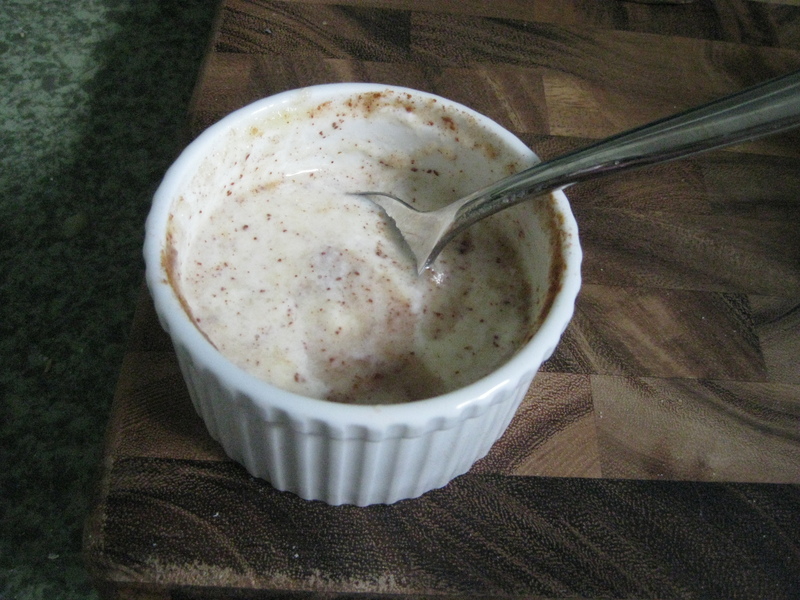 I snacked on some plain yogurt mixed with applesauce with a sprinkle of cinnamon. That was around 2, but it did not fill me up very much. 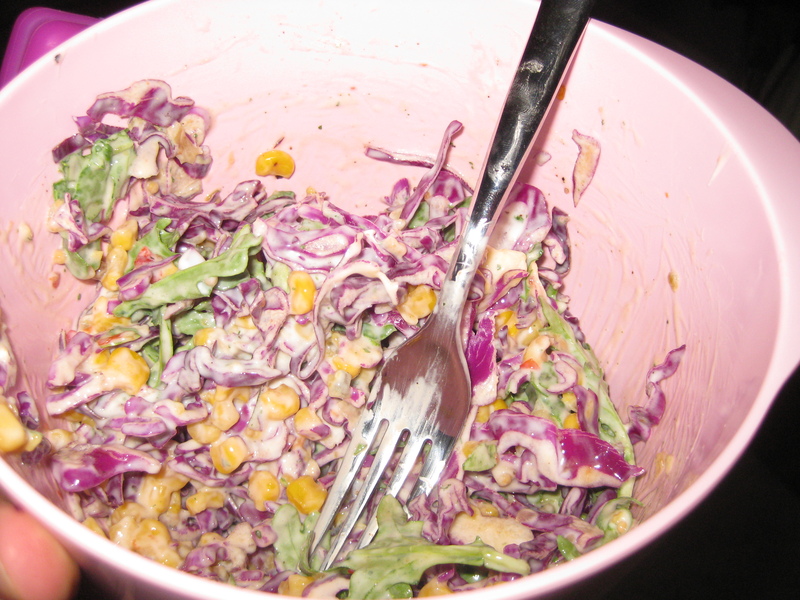 I decided to make a little Corny Coleslaw to fill me up. It did the job!